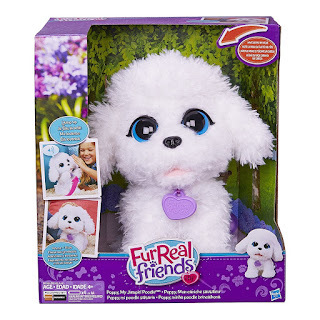 HURRY over to get this FurReal Friends Playful Pets Poppy, My Jumpin' Poodle for ONLY $9.91 (Retail $39.99)! Poppy, My Jumpin' Poodle pet is sweet, soft and so excited to play! Pet her head or wave at her and she'll jump up on her hind legs and bark, just like a real little poodle! Pet her back and she'll sit like a good girl. Poppy, My Jumpin' Poodle pal is ready for fun!